Discussion in 'Cases & Case Modding' started by Zarathustra[H], Sep 18, 2018. I recently bought a Streacom FC5 fanless case (my second) for a build for my Fiance. I had an issue with it. The front USB ports don't work properly with the USB3 header and their special USB3 cable. 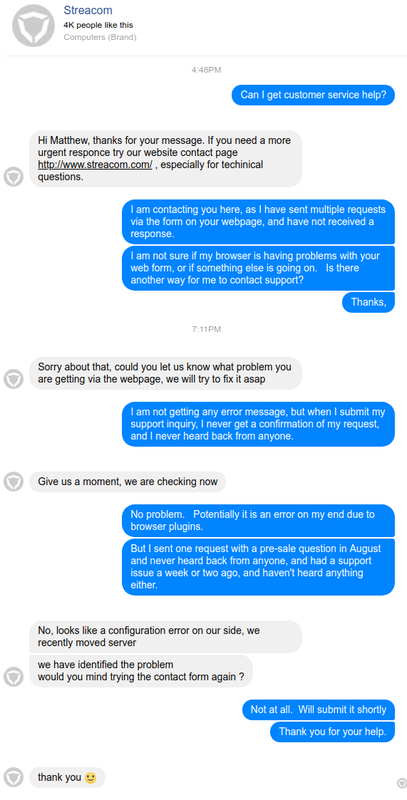 I have contacted Streacom Support twice via the form on their webpage, and never heard back from them. Complete crickets. Not even a confirmation email. Last time I contacted them (with a pre-sale question back in early 2017 when I built my HTPC regarding what riser to use, I didn't get a confirmation email, but I did get a response within a couple of days. Now it's been a couple of weeks, with no response. Anyone know if there are any troubles over at Streacom? Or maybe their form just isn't cooperating with my browser? So, have no fear, turns out they are still very much alive! I went on Facebook and clicked contact. One of the predefined questions was "Can I get customer service help?" so I clicked that. The following is what ensued. So, it turns out it was just a misconfigured server. It's odd that they didn't get confused about not getting any customer service requests for a while, but I'm glad I can now contact them.